Born in Memphis, Arthur Lee later moved to Los Angeles where he first saw The Byrds. The folk rock act represented a break with the usual rhythm and blues format previously played at the clubs, and had an enormous influence upon him. Lee had formed and disbanded a number of groups since moving to LA, including The VIP's and Arthur Lee and the Lags. After hearing The Byrds he formed The Grassroots which included former Byrds roadie, Maclean; Forssi (earlier with The Sufaris) and Memphis-born Echols. They began to play around the LA clubs, but Lee discovered that another band had got first rights to their name and it was changed to Love. 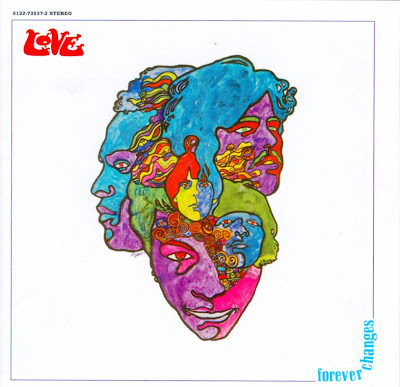 Love made their debut at the Brave New World in Spring 1965 and by the early summer of that year, Jac Holzman (head of Elektra records) discovered them playing at the Hollywood club, Bido Lito's. Elektra were looking for one of the new folk rock acts, and eventually signed them up. They quickly became a cult attraction and by 1966 had a residency at Bido Lito's. Their debut album Love was impressive, containing the drug-orientated Signed DC, Hey Joe and My Little Red Book. Signed DC was dedicated to Don Conka, who would have been in the band but for his drug problem (ironically with most people presuming him dead he did turn up in a late eighties reformation line-up). The list of bands who subsequently recorded Signed D. C. included December's Children, Rising Storm, Axis Brotherhood, Jeff Dahl Group, Fallen Angels, Sidewinders and Dead Moon. Another of its finer moments was Softly To Me, a fine track with haunting vocals and clashing guitars, released briefly as a single. Before the release of their follow-up LP Da Capo, Lee bought in Michael Stuart (formally with LA band The Sons Of Adam) on drums and Tjay Cantrelli on horns. 'Snoopy' Pfisterer was transferred from drums to keyboards. This album contained their second hit single 7and 7 Is, The Castle and Stephanie Knows Who. Whilst Orange Skies would set the style for their following album, the whole of side two was taken up by the highly ambitious but only partially successful twenty-minutes long Revelation. 7 and 7 Is was perhaps their most influential track. It was later covered by Alice Cooper, Billy Bragg, Marshmallow Overcoat, Sidewinders, Fuzztones, Spiral Jetty, Barracudas and The Blues Inc. among others. Pfisterer and Cantrelli had both departed before the band released the masteful Forever Changes as a five-piece. Both Bob Harris and Penny Valentine chose this as their favourite album of all time in Paul Gambaccini's book "Critics Choice: Top 200 Albums". Almost every track was a classic and Alone Again Or and Andmoreagain were further U.S. hit singles. Alone Again Or was later covered by The Damned and UFO. Many of the other songs flowed gently with muted guitar leads, soothing brass, sweeping string and often nihilistic lyrics. Lee chose haunting surrealistic lyrics, often making play on words. The drug influence which helped inspire this album was also to be the group's undoing. They scarcely left their former horror movie set/house near Hollywood, and when they did record another album it was too awful to release. Lee broke the band up and formed a new one comprising Frank Fayad (bs), George Suranovitch (drms), and Jay Donnellan (gtr) (all from Nooney Rickett), although additional musicians were used on recordings. Four Sail was their last album for Elektra and subsequent albums were comparatively disappointing. They managed a tour of England in 1970, but after the failure of False Start, Lee split the group again and worked on his solo album. Later, he would try unsuccessfully to form another version of Love. Somehow Arthur Lee got mixed up with Robert Stigwood and the result was Reel To Reel, a disco-influenced album with a female backing group, The Blackberries and a horn section on many tracks. Best avoided! It is unlikely, however, that the mellow blend of their first three albums will ever be repeated and Love are best left alone to be remembered as one of the very best of the LA rock bands. Material from their early years is thoughtfully compiled on Rhino's Best of Love (RNLP 800), which was repackaged in 1987. Love Live (Rhino RNDF 251) (1982) and (Line LLP 5152 AP) 1983 is a recording of a reunion concert at the Whiskey A Go Go in 1978. It includes gorgeous versions of Orange Skies and Old Man but the rest is pretty inept. Several former Love members went on to play with other groups: Tjay Cantrelli joined Geronimo Black, Jay Donnellan (aka Jay Lewis) formed Morning with Jim Hobson, Gary Rowles formed Cottonwood and joined Richard Torrance's Eureka. Live/Studio (MCA 27025) 1982 consisted of previously unreleased material live from the Fillmore East in 1970 and eight remastered tracks from the Out Here album. The live side is an energetic pedormance by line-up G and notable for its inclusion of the otherwise unavailable Product Of The Times. Out There (Big Beat WIKA 69) 1988 includes the best of Love's Out Here and False Start albums. In 1987 Lee reformed the band as a four piece, backed by Berton Averre (ex-The Knack) (lead gtr), Sherwood Akuna (bs) and Joe Blocker (drms), as part of the 'Psychedelic Summer of Love' package. Their short half hour sets featured mostly material from their Elektra period:- 7 And 7 Is, My Little Red Book and Andmoreagain. In 1992 and 1994 Lee again played to packed audiences, in one-off London gigs, which were captured for posterity on the Once More Again CD. In particular the 1992 set is memorable for the admirable backing by The High Llamas, who provided lush orchestral backing on tracks taken from the first three Love albums. Arthur Lee subsequently stole the show at Creation records 10th anniversary bash at the Royal Albert Hall.